By FOIA, we’ve shown that redistricting is so on the table that it is written into the grant proposal. By FOIA, we’ve shown that, weeks earlier, Devono conveyed privately to architect Shriver that the “needs” of the new school are for about 700 students. BoE Minutes: “She [Katy Ryan] wondered how the Mileground property emerged [as the preferred site for the green school]. Superintendent Devono…stated…that a main consideration for the consolidation is a central location for the two schools. By FOIA, we’ve shown that Devono’s original preferred location was actually nearly a mile down route 705, which happens to be in North Elementary’s catchment basin. In any case, that spot is the exact distance from Easton school as the old UHS possible green school site, and less than two tenths of a mile closer than the Woodburn schoolgrounds possible green school site. 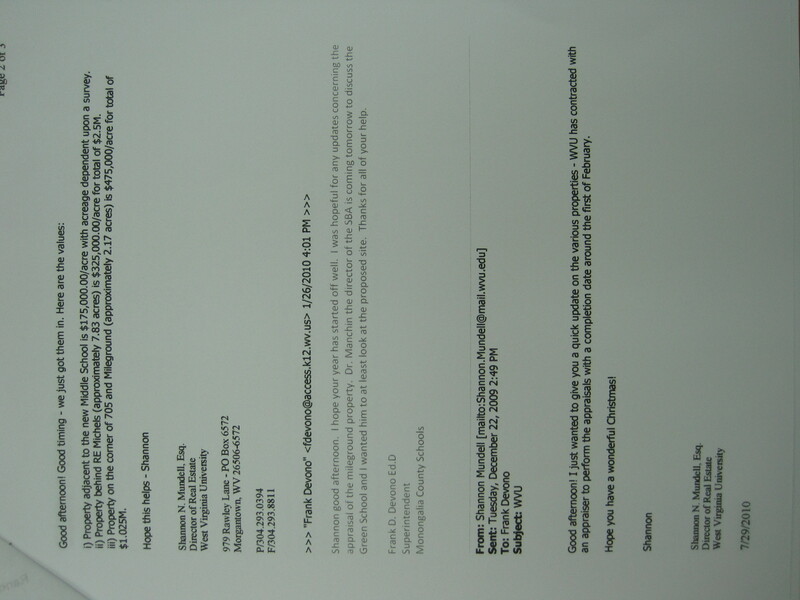 Second, by FOIA we know that months earlier, by February 3rd, Mon Schools had an appraisal for the Mileground site. Why did it not appraise the MM/UHS site? “i) Property adjacent to the new Middle School is $175,000.00/acre with acreage dependent upon a survey. No appraisal? On the contrary, by FOIA we know that Mon Schools had an appraisal in hand showing the rejected land to be virtually half the price of the chosen Mileground site. Again, by FOIA we know that the email exchange between architect Shriver and Devono that Devono “needs” the new school to be about 700 students occurred in early June, weeks before the Woodburn closure meeting. By FOIA, we learn that WVU Campus Planner Bob Merow states (March 12) of architect Shriver’s school site evaluation questionnaire: “I found the information on the three sites to be grossly inadequate to respond to the 17 factors. The following are a few examples.” Merow then lists and comments on 10 examples of the “grossly inadequate” evaluation. Mon BoE pretends that the architect could and should site the school for them. Board member Clarence Harvey sees fit to explicitly “defer” on site selection at June 8 board meeting to the “expert” architect. In a forthcoming post, more FOIA and facts on the deceit and manipulation, in addition to the negligence, involved in the Mon BoE efforts to close Woodburn Elementary in its ongoing attempt to site the green school at the 705/119 intersection on the Mileground: How the School Board was Strong-Armed.